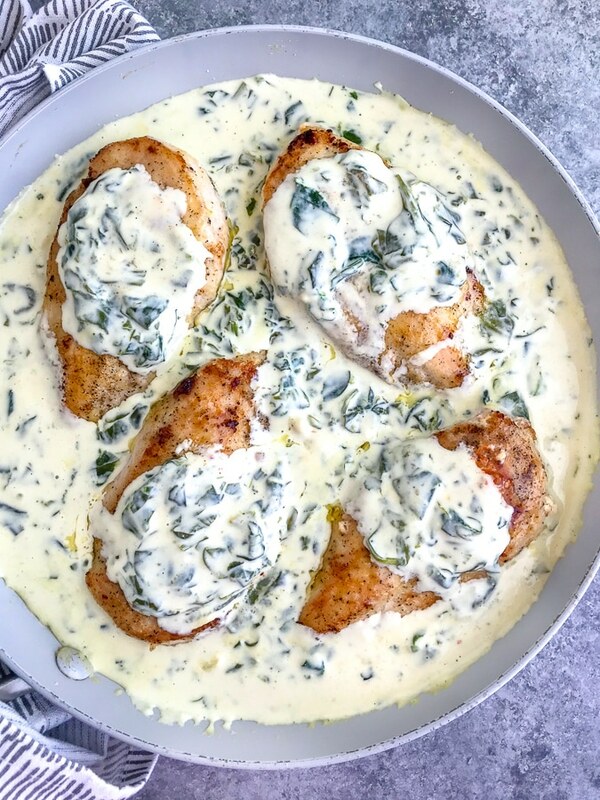 This Date Night Chicken Florentine is an easy 30-minute meal that is true comfort food at it’s finest. 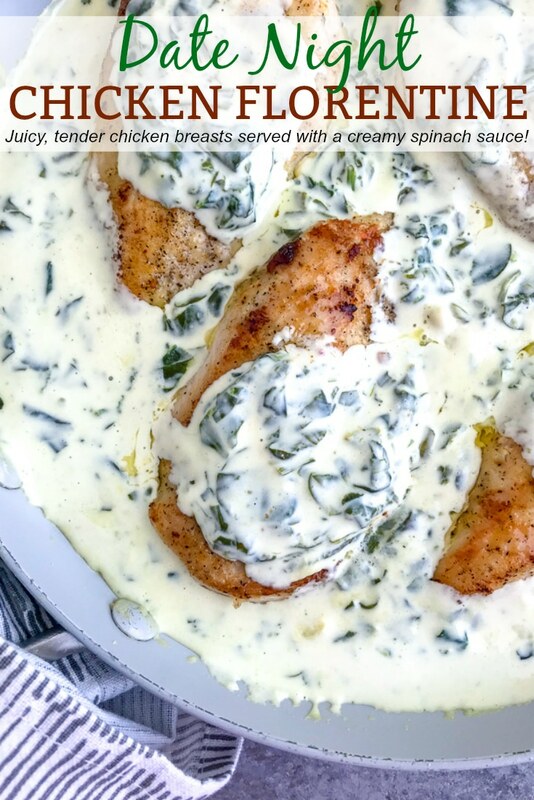 Creamy spinach sauce simmered with juicy, tender chicken breast. Perfect served over a bed of sautéed kale, with steamed vegetables, or tossed with your favorite pasta. As named, this recipe is perfect for a date night in. So if you’re looking to wow your significant other with some delicious cooking skills, then this is the recipe for you! 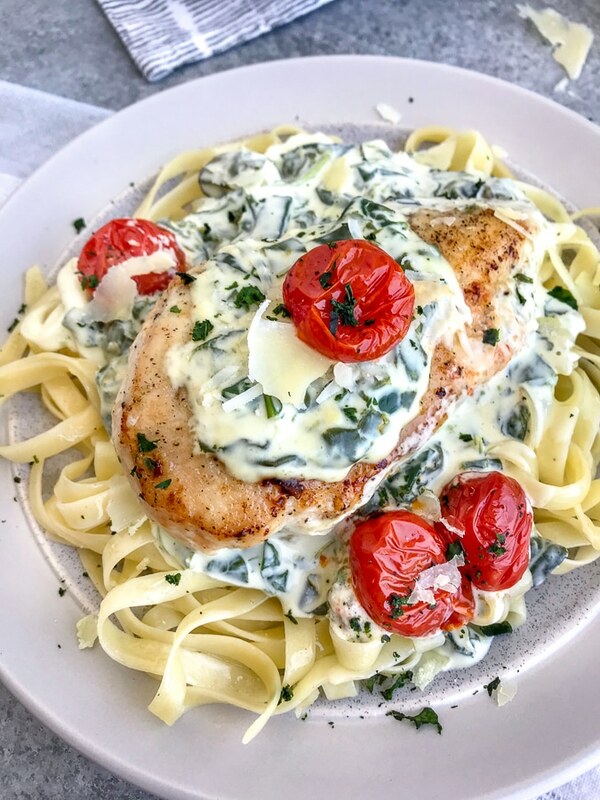 The sauce and chicken all cook in one pan, taking a lot of the stress off of you, so that you can spend more time with your guest and less time stressing over a recipe. This recipe is also wine-free, but you’re more than welcome to add a splash of white wine for additional flavor. 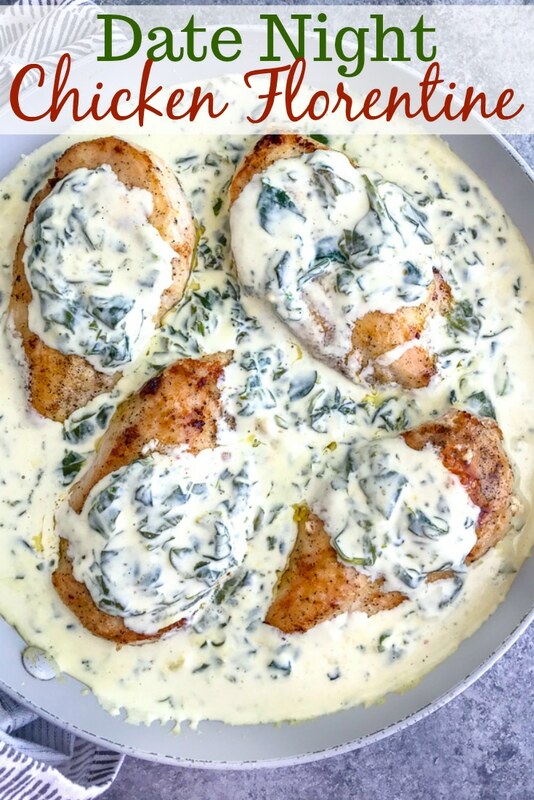 The key to getting juicy, tender chicken breasts with this recipe is to coat the chicken breasts in cornstarch. The cornstarch is key. It helps to lock in the juices and flavors of the chicken breast, keeping it super tender on the inside, while perfectly searing the outside. Spinach: The recipe calls for fresh baby spinach, but frozen can be used. I recommend fully thawing the spinach before cooking. Half and half: This can be substituted with heavy cream or whole milk. Additions: I love this served with blistered tomatoes or sliced mushrooms. If adding mushrooms, I recommend adding them in with the shallots and garlic. Sauté until fork-tender. Blistered tomatoes: Cook in a separate small pan with olive oil over medium heat just until the skin starts to wrinkle/blister. What to serve it with: This is delicious tossed with pasta, over buttery mashed potatoes, or over rice. If looking for a healthier side, I recommend a side salad, sautéed kale, or steamed vegetables. Cornstarch: This is my favorite way of cooking chicken. Season the chicken breast with salt and pepper prior to coating in cornstarch. The cornstarch will help to sear the outside while locking in the flavors and juices on the inside. Resulting in tender, juicy chicken breast every time! Alternatively, you can use flour or arrowroot. Sodium: I recommend adding salt after you have added the stock, cream cheese, and spinach. All will have a degree of sodium in them. This recipe calls for unsalted chicken stock, as I prefer to control the amount of sodium that goes into a dish. 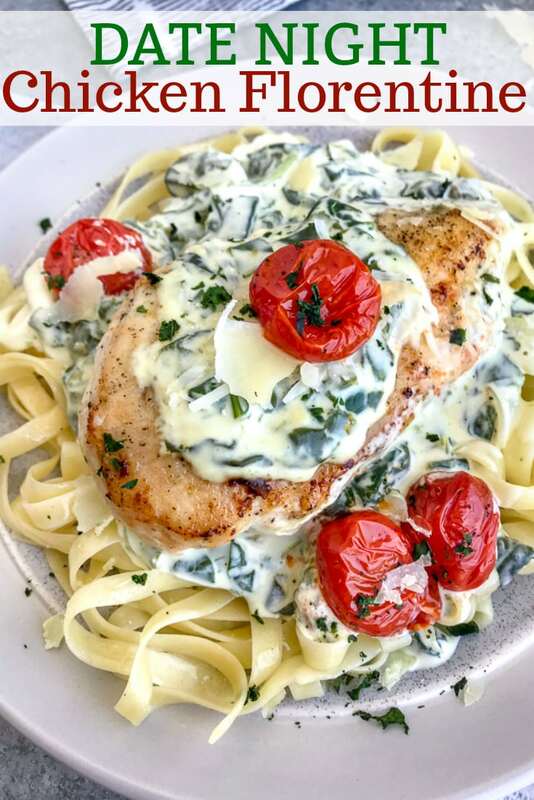 Pan-seared chicken simmered in a creamy spinach sauce that is perfect served with a side of steamed vegetables, over pasta, or rice! Incredibly easy and out of this world delicious! Place a large, nonstick skillet over medium heat with 2 tablespoons of butter. While the butter is melting, sprinkle each chicken breast with salt and pepper, to taste. Next, coat each breast with cornstarch, rubbing it in on both sides. Once the butter has melted and started to bubble, add the chicken breasts. Cook until brown, approximately 4-5 minutes per side. The internal temperature should read 165 degrees F using a meat thermometer. Once cooked, remove to a plate and cover to keep warm. Using a paper towel, wipe out the pan. This will ensure that the end result sauce will be white. This step isn't necessary, as you can keep the butter residue for flavoring. If kept, the sauce will be more tannish-brown in color. Either method will result in a delicious dish! Add 1 tablespoon of butter to the pan. Once melted and bubbling, add the shallots. Cook 1-2 minutes or until translucent. Add minced garlic and cook 30-60 seconds - until fragrant. Use a wooden spoon to scrape any brown bits off the pan. Pour in the chicken stock. Increase the heat to medium-high. Bring to a boil and allow to cook until the liquid has reduced by a third. This will take 2-3 minutes. Lower the heat to a simmer. Add the half and half and stir to fully incorporate. Allow to simmer 3-4 minutes to thicken. Add chopped spinach and cook 1-2 minutes, or until wilted. Stir frequently while it wilts. Add in the cream cheese, stirring to fully mix making sure the cream cheese melts. Season with parsley and stir. Allow to simmer 3-4 minutes to reduce and thicken the sauce. Season with salt and pepper, to taste. Add chicken breasts back to pan to warm. 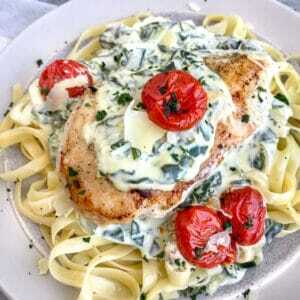 Garnish with additional parsley (if desired) and freshly shaved parmesan cheese. Serve over a bed of cooked kale, tossed with your favorite pasta, or with a side of steamed vegetables or salad! If serving with blistered tomatoes: place a small, nonstick pan over medium heat with 1 tablespoon of olive oil. Once the oil is hot, add 1 cup of blistered tomatoes to the pan and cook until the skins start to wrinkle/blister. Thank you kindly for your feedback, Betty! 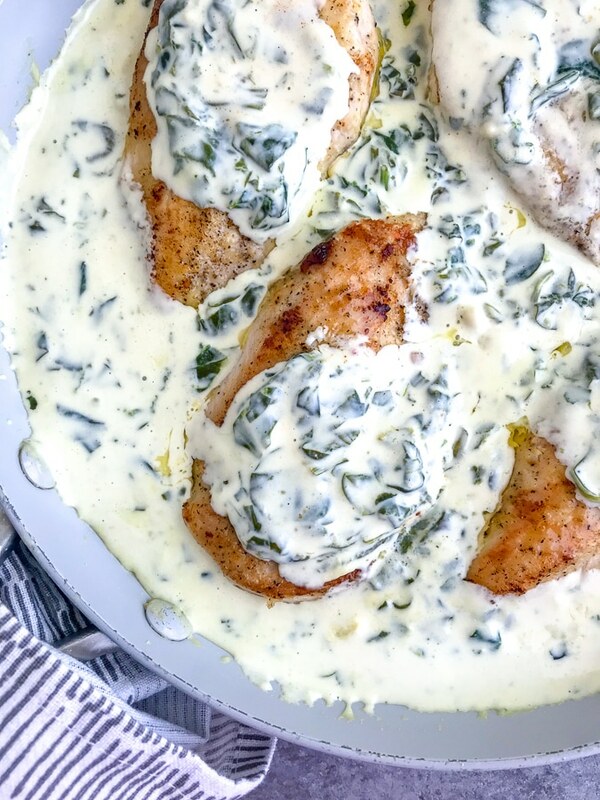 I’m happy that you and your husband enjoyed the recipe – spinach and all! I’m thinking about meal prepping this, do you think it would reheat nicely? At most it would be refrigerated for 3 days. It reheats fine for me! But remember, as with any pasta and sauce – the sauce thickens as it sits and is reheated! THank you! It was such a hit I only ended up having enough left over for the next day, and it still tasted great.